Dregano Holy Arch Christmas Carousel Pyramid Made in Germany by Dregano at Two Clock. MPN: 85265. Hurry! Limited time offer. Offer valid only while supplies last. Set under the Holy arch and in the shade of the desert palm tree is the Nativity Manger scene set on a slightly elevated stationary ledge. Set under the Holy arch and in the shade of the desert palm tree is the Nativity Manger scene set on a slightly elevated stationary ledge. Surrounding them on the rotating tier are the 3 wisemen bearing gifts and the shepherd with his sheep. 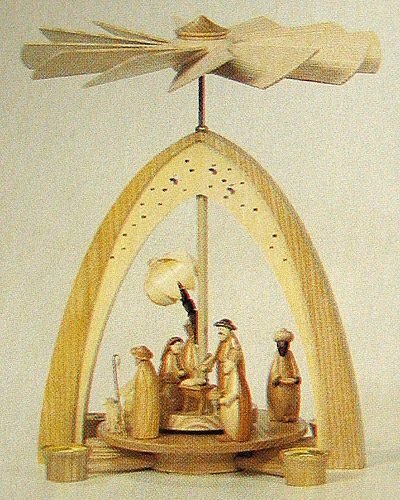 Beautiful in the simplicity of design this Holy Arch Christmas Pyramid stands over 10 1/2 inches tall uses 4 medium. candles and was handcrafted in one of the cottage industries in the Erzgebirge Mountains working with a Cooperative of other Artisians in Seiffen Germany. Handmade by the Artisan Coop. The German Pyramid will make your holiday dreams complete while envisioning the unfolding Christmas scenes.